The last chance for presidential candidates to connect with students in a public platform was Monday at the Waterloo Open Forum. 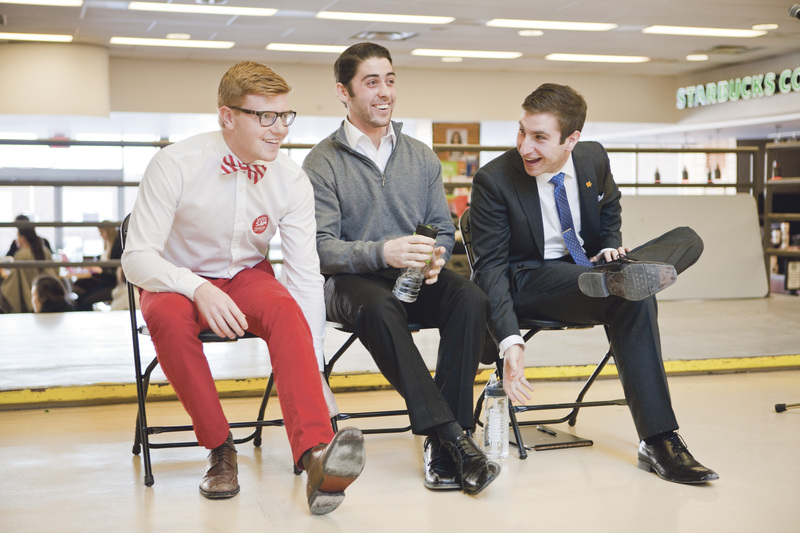 Presidential hopefuls Justin Tabakian, Chandler Jolliffe and Sam Lambert spent an hour-and-a-half in the Concourse answering questions regarding their platforms, hypothetical situations if elected and understandings of operations and various campus partners. Annie Constantinescu, current Students’ Union president, asked the candidates what they believed was a typical work week for the president. “My daily routine would probably be meetings, emails and meeting with students,” said Jolliffe. Tabakian explained that 80 per cent of his work week would be dedicated to things that would come up on a daily basis while the remaining 20 per cent would be ideas put forward in his platform. “I would put emphasis on team management, ensuring people are focused and happy, as well as dedicated to the students on campus,” said Lambert. The intention of the School of Business and Economics Students’ Society (SBESS) to secede from the Students’ Union, which has been a recurring topic through much of the campaign period, was brought up once more in the Open Forum. The question regarding it, however, was directed at Jolliffe and a video he released during the campaign period that addressed the situation between the SBESS and the Students’ Union. Jolliffe added that while SBESS has been a pressing issue during this year’s elections, it is not the only faculty on campus. Another question asked the candidates who they thought their biggest competition was and why they were better. Jolliffe did not identify one candidate, saying that he viewed his competitors equally. However, Tabakian believed that Sam was his biggest competition. “I kind of see myself as the underdog, though I would say I do the best job of representing the average student,” he continued. “He has a strong presence on campus that reaches out far. I would say I’m relatable and approachable, and capable of being president,” said Lambert. Overall, the candidates were pleased with the forum’s turnout. “I think it went well. It’s great to see so many students come out and engage in the elections and I think that is the best part of the forum: students coming and asking their questions,” said Tabakian. In terms of whether they thought the Open Forum would impact voter turnout, the candidates thought most of the voters’ minds were already made up. “I don’t think Open Forum impacts voter turnout as much as campaigning teams. It’s really a lot of the marketing, connecting with students one-on-one when you’re boothing, that’s the stuff that people remember,” added Lambert. While the candidates tried to use the Open Forum to differentiate themselves from one another, Tabakian acknowledged that they all put a lot of work into their campaigns.